Office Cat-5e Cable in Industrial Ethernet Networks (Ethernet/IP, PROFINET, Modbus TCP)? Industry, at least, has figured out that using office grade switches in industrial settings is a really bad idea. Those who decided to try office grade switches soon figure out it is not a great idea after they have replaced 2 or 3 in a year. Cabling is not that obvious. Anyone who has spent some time looking at Industrial Ethernet Networks has seen PLC’s wired with standard office grade cables into an industrial grade switch. They do work, or at least appear to work. Before I elaborate on that let’s look at what should be used. 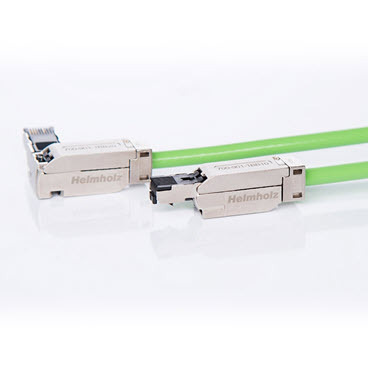 Industrial Ethernet networks such as PROFINET recommend a shielded cable that is grounded at both ends. This grounding method is your best protection against EMC noise interference (see IEC 61000-5-2 for full details on why). Standard Office Cat-5e cable is un-shielded and therefore is more susceptible to EMC noise. Therefore, when you use standard office Cat-5e cable in an industrial setting you can expect to see at least some bit errors depending on the overall noise. However, when talking to the people dealing with these networks and you ask them about bit errors, they say ‘We have not had a problem’. I can think of two reasons for this. First, Ethernet is so fast and the warning levels set high enough that you can have several problems but a valid message will still make it to the device in time. Second, these errors are still recorded but most systems are set up so that they are not visible. They are hidden away in the switches. Therefore, to the casual observer, there are no problems. However, put a monitor like Atlas or Mercury on the network and you will see it. The next questions are; Is this really a problem? Is it worth the added cost of using the recommended cabling? I would say ‘yes’ and ‘yes’ because being a comms guy. I want rock solid communications. However, I am sure some of my customers will look at the added cost and say, no the added robustness is not worth it. At least they will think that right up until the network goes down. If you would like help with your Ethernet Installation, please contact us.